I've just started reading this and have to say I purchased it with some reservation. 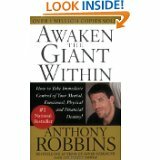 If you're not aware, this is a famous book by Anthony Robbins. I reserve judgement on people whom I perceive to be bigger than their work or the messages contained within. I prefer Stephen Covey for that reason as he walks his talk more and his work is less about him and more about the messages. Tony is a huge personality and a celebrity. I don't have an issue with that per se. He does attract more detractors who are not convinced of how genuine he may actually be....Me...? Right now it makes sense for me to "err on the side of generosity". 1. Raise your standards; By doing this, you make a statement about what you don't want (You tell your brain you're upping your game) This means you take a position on what you want and decide what you're not going to settle for. "In 2011 I will only work with clients who really want to do the work as opposed to people who are willing to pay..." Would be an example of raising your standards. 2. Change Your Limiting Beliefs; If you take a new stance on things, you need to rid your system of the old way of doing things (you need a new mindset and to rid yourself of the fears you had in the past which kept such clients or opportunities from you) You need to work on these beliefs to ensure you don't lose belief in yourself in support of your new standard. 3. Change your strategy; Whatever action you were or were not taking in the past was not allowing you to access this opportunity (perhaps you were unaware of this)You need to devise a new set of actions to support the new beliefs in service of the new standard. The rest is learning and part of this exercise in to lose the fear of making mistakes. Robbins invokes something Nietzsche once famously said-paraphrase; "when we make a firm decision, providence moves also" I actually believe this has a lot of truth in it. We need a complete system to line us up for success. I will no doubt do more posts about this work or the author! I'm off to put that sound advice into ACTION...What are you waiting for...??! Did you ever finish the book? I have just started acting on the information from this book. I am taking on the 10 day challenge. Did you ever do the 10 day challenge, if so how did it go?